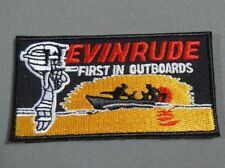 EVINRUDE- First In Outboard Motors Iron On Jacket - Cap Patch 3"
Evinrude -First in Outboards iron on embroidered patch. 3 " x 1 1/2". For cap, jacket, gear. 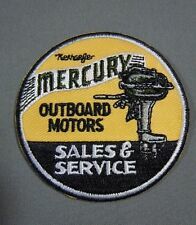 MERCURY Outboard Motors - Sales & Service - Iron On Jacket - Cap Patch 2.5"
This is not vintage as the rust is printed. However it was cool so I bought a couple of them at a show back in the day. Size - 11 x 17. The boats range in size from the small 13' runabouts to the large 28' twin engine hardtop. 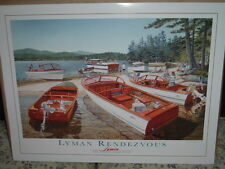 These prints would make a great addition to any wood boat enthusiasts collection. Many prints are available. Resorter 18. 1984 Century Boat original factory sales brochure in mint condition and has never been "used". This IS NOT A REPRODUCTION.this is the real deal. This brochure is 28 pages including front and back cover. INCLUDING PROOF TO SHOW YOU EVERYTHING IS CORRECT. BOAT LETTER COLOR #1__________________. REPLY TO PROOF! ONCE YOU APPROVE PROOF IT WILL TAKE. Port of Call text Directions Included! Then simply fill in the _______ Blanks. For sale, a Johnson outboard motor sign issued by Outboard Marine Corp. OMC went bankrupt in 1999 and Johnson motors discontinued in 2007. Sharp sign of a gone by era. Sign has been on display and may have imperfections. The letters are one decal, but the numbers are each individual decals. Models: Pro 205. 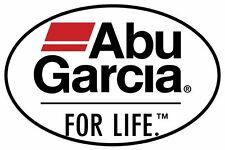 We're your port for thousands of hard to find boat parts, original manufacturer's parts and marine surplus. Check out this deal! MMC1040 on back of the plate. holes with 13" apart center on center. Engraved marking reads. Part number: 123749. We're your port for thousands of hard to find boat parts, original manufacturer's parts and marine surplus. Local Estate Find, Rare Item, Outboard Motor Carry Bag, Made By Burch Mfg. Co. of Fort Dodge Iowa, Printed With "OMC" For The Outboards It Fits, Not Sure If It Was a Stock Item or Custom Made, Probably From 1950's or 60's, Measures 44" X 25", Zippers Work, Zippered Storage Pouch On One Side, Small Mouse Hole In Canvas, Solid Bag With Great Patina, Very Collectible. Resorter 18 (back in lineup again.none built 1976-1980). Coronado (another inboard bought back.none built 1977-1980). 1981 Century Boat original factory sales brochure in mint condition and has never been "used". (One for each side of your boat) (Default Block Ariel Letters and numbers). INCLUDING ONE PROOF TO SHOW YOU EVERYTHING IS CORRECT. (YOU MUST REPLY BACK TO APPROVE). BOAT LETTER COLOR #1__________________. Here is a very rare cover carry case for the martin #40 outboard boat engine motor. case shows a few minor holes that can be sewed together if u wanted to. BOAT NAME DESIGN LETTERING GRAPHICS Transom Marine Identity 24" x 7"
BOAT LETTER COLOR __________________. ONCE YOU APPROVE PROOF IT WILL TAKE. Then simply fill in the _______ Blanks. Size: 21 x 27 cm / 8.3" x 10.6" softcover. NO RESERVE! It is in EXCELLENT Condition - BETTER THEN Photo's. Arabian 180. Arabian 200. 1980 Century Boat original factory sales brochure in mint condition and has never been "used". These ARE NOT REPRODUCTIONS.these are the real deal. This brochure is 28 pages including front and back cover. Arabian 180. Arabian 200. 1978 Century Boat original factory sales brochure in mint condition and has never been "used". These ARE NOT REPRODUCTIONS.these are the real deal. This brochure is 24 pages including front and back cover. GREAT WAY TO BUILD OR ADD TO YOUR BOAT BROCHURE COLLECTION. 1978 thru 1987 Century Boat original factory sales brochures in mint condition and has never been "used". These ARE NOT A REPRODUCTION.these the real deal. HAS A COUPLE MINOR SCRATCHES. SIGN HAS VELCRO ON REAR FOR MOUNTING. Vintage Fairliner Emblem Boat? Chrome 1950-1960s? 1950-1960s?. You can see if an item has a defect, owners marks, etc. No warranties on anything. Original Johnson Sea Horse Sign From the 1950's. There are 6 holes in the sign. Raised Lettering, made by the Sciota Sign- Kenton O. Chicago Illinois. Very hard to find NOS pair of sparkplugs. AQUARIUS - JOY - VANISH - KAMINO MORE. 16" x 24" Deluxe Sewn US Yacht Ensign Flag. These deluxe sewn flags are constructed from lightweight yet durable fade resistant polyester fabric, which make them the perfect all-weather flags. Individually Sewn Stripes. Don Aronow Cigarette Boat Ads. Condition is Used. But in amazing condition. Comes with a business card with a 2011 calendar. Registration Numbers stickers Reg#s Marine Identity Decals Proof 2X 20" x 3"
(One for each side of your boat) (Default Block Ariel Letters and numbers). ONCE YOU APPROVE PROOF IT WILL TAKE. One price for. FAST EASY AND FUN PROCESS! Then simply fill in the _______ Blanks. Hangs or sits on a table. It works great, needs work on the supports. Johnson Outboards iron on embroidered patch. 3 1/2" x 1 1/2" For cap, jacket, gear. BOSTON WHALER. 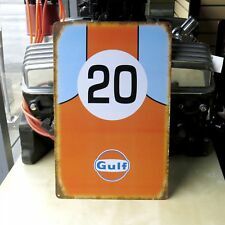 Perfect addition to your garage or recreation room. VINTAGE 1952 JOHNSON SEA-HORSE OUTBOARD ENGINES BROCHURE/FOLD OUT POSTER & MORE! A RARE FIND! ALL IN COLOR. NICE SHAPE, MINOR WEAR & TEAR, SMALL SIGNS OF AGE & USE. ALL MODELS FROM THE 25HP TO THE 3HP. Boat part number 1069858 is a new pelican colored hooded sweatshirt from Great Lakes Skipper. Pullover hooded sweatshirt with Great Lakes Skipper logo. Applique style logo with embroidered text. Color: Pelican (Light Gray). The original Manufacturer's promotional brochures are great to display in your vessel's salon. 42ft Bertram Motor Yacht Brochure. BERTRAM 42FT MOTOR YACHT (117 pages). BERTRAM 390 CONVERTIBLE (173 pages). Very sharp condition and minimal dirt or wear. You need it to complete your display. You'll like it! THIS IS A SUNSATION POWERBOATS DEALER BANNER IN GOOD CONDITION.BANNER IS VERY LARGE ,IT IS ROUGHLY 14 FEET TALL AND 22 FEET WIDE. We were able to pop the larger ding out a little so it is actually a little better than what is pictured. Little dirty on top. Easily cleaned. This is a u.s. 16 fl. 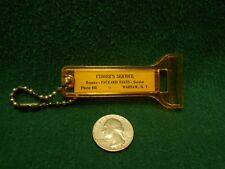 Manufactured by Quaker State Oil Refining Corp. or Oil City, Pa. This is a collection of sixteen(16) air/electric horns that my father had. One has the horn bell broke off the base. These can be used as is, for show or display, or used for parts for other horns. Kiekhaefer Mercury 90-36565 Dealer Service Award Plaque - Great Memorabilia!